The 30-30 Winchester is likely the most popular ’starter’ deer rifle in the United States. In the form of the Winchester lever action repeater it is also a combat veteran with a solid reputation for reliability. Having served in war in the American Midwest, it has functioned reliably in desert and arid region conditions. The Russian army used a Model 1895 in the frozen battlefields of World War I. Both of these examples, and the lack of negative historical commentary on the weapons function, are good indications that you can expect a well-built lever action rifle to function well even in severe environments. There are technical reasons why the lever action, especially chambered in 30-30 Winchester, is more reliable under adverse conditions than the typical semi– or full-auto firearm. 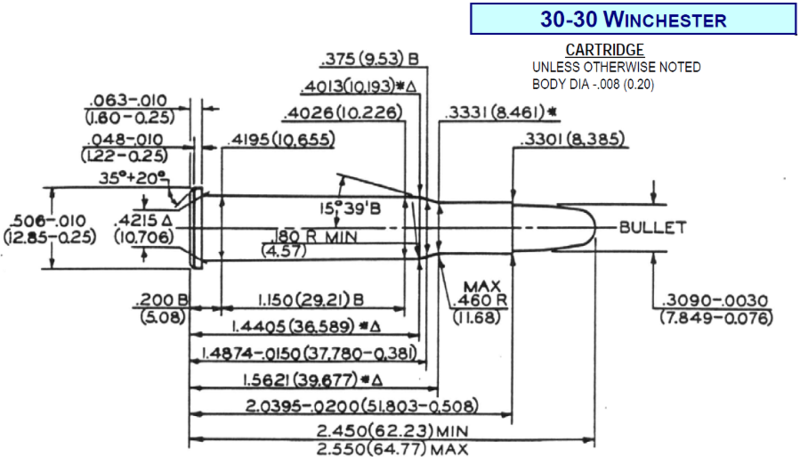 A cartridge drawing of the 30-30 Winchester with the areas of importance highlighted is shown in Figure 1. The 30-30 Winchester cartridge headspaces on the rim of the cartridge, denoted by a red arrow. Dirt and sand have the unfortunate characteristic of ‘seeping’ into crevices and filling the smallest of clearances, increasing the friction between parts significantly. The most critical part to the 30-30 cartridge going into battery is the rim area. In theory, the contaminant sand can then flow into the interface between the chamber and the cartridge surface of the rounds that are subsequently loaded into the chamber. You can using an area that you can easy clean with your shirt as a type of ‘funnel’ to push the dirt towards a less critical area. Cartridges that headspace on the shoulder are more vulnerable to this and cartridges that headspace on the case rim are the most susceptible to foul weather malfunctions because there is less less-critical area to which the sand can be pushed. Additionally, the lever formed by your hand at the end of the operating lever can create considerable leverage compared to the charging handle on a more modern military rifle … if you are lucky enough to have a reciprocating charging handle on your gun at all. While it is certainly possible to shoot a 30-30 level action rifle to 200-300 meters, it is safe to say that 100 yards is a more realistic range if using the iron sights. You have to be careful to use only bullets that are specifically labeled for usage in the 30-30 Winchester lever action … the typical pointed rifle bullet poses a risk of initiating the primer of the cartridge in front of it in a tubular magazine. To overcome this limitation, and the aerodynamic drag imposed by the traditional exposed lead softnose bullet, Hornady has introduced the LEVERevolution line of ammunition. This line of ammunition utilizes a soft ‘ballistic tip’ type projectile to reduce aerodynamic drag as the bullet moves downrange. 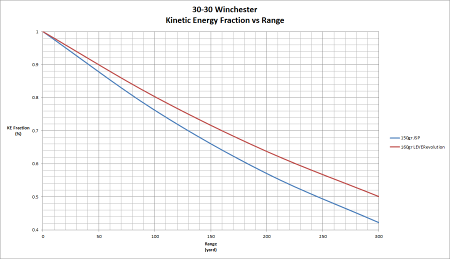 Figure 2 illustrates the fraction of the bullets original kinetic energy remaining as it moves downrange. This was done because the Hornady bullet is 160gr while the conventional bullet weights in this caliber are 150gr and 170gr so no exactly matching data set could be used. The Hornady LEVERevolution appears to have a significantly-lower aerodynamic drag and that the drag reduction seems to show greater effect as the range is increased. Ammunition selection for the 30-30 Winchester is easy—find one brand of ammunition labeled for 30-30 Winchester that shoots accurately in your firearm and that functions well when shot into ballistic gelatin blocks. Heavy Clothing is placed in front of the gelatin block to simulate an attacker wearing winter clothing.